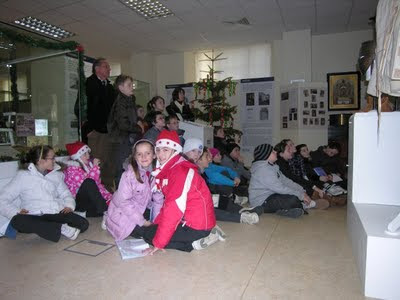 Today we had a visit from a group of children from Abbeyside National School. They are currently learning about The Moresby, a ship that went aground in Dungarvan harbour on Christmas Eve 1895 with the loss of many lives, the youngest being the daughter of the Captain, Ivy Neesham Coomber who was just two years old. The children were able to look at the Bible belonging to the youngest crew member aboard, apprentice Eugene J. Sibert who was only fifteen when he perished, and also The Moresby bucket, which are among many artefacts relating to The Moresby here in the Museum. The story was brought to life with the children viewing "Tragóid an Moresby", which our President, Níoclás ó Grífáín contributed to greatly. Waterford County Museum are delighted to be able to assist in the teaching of local history and we welcome teachers and students alike to visit us.